If you missed our market update webinar yesterday, don’t worry. It’s available on-demand. If you’re too busy for the whole webcast, zoom forward to 30:21 to hear the Q&A. It’s worth it. Oil prices continue their pursuit of higher prices. Markets began with some early gains this morning, with crude oil up 76 cents to $66.27. At this point markets have fully recovered from their February decline, and are approaching three-year highs once again. With the threat of Chinese trade barriers beginning to calm, markets are back to watching fundamentals and risk factors, which point to higher prices for the year. 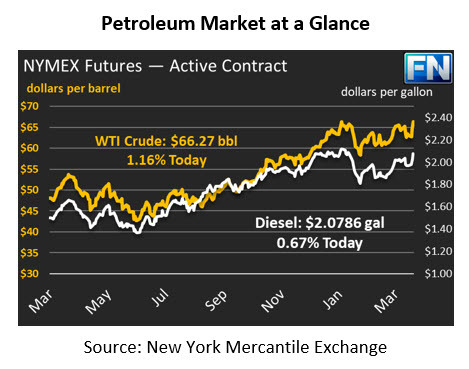 The API released their weekly data, showing that crude and gasoline stocks rose while diesel inventories fell. We’re still at a time of year when crude builds are the seasonal trend, so markets aren’t too worried about the builds. Additionally, the API has tended to have some big variances to the EIA statistics, so markets generally react more strongly to EIA data than to the API.